My husband and I have been “dating” for 10 years. 10 years ago, I had an awful day at my crummy job. I got off work, and called the guy I was talking to and complained all about it. He lived 7 hours away, and jokingly said “You should just come see me! !” and I replied “OKAY!”. He was shocked- “wait? what?! Are you serious?! ?” And I replied “Hell yes! Screw that job. I’m calling out.” Terribly irresponsible decision. But thats what 19 year olds are good at right!! So I did. I called out and drove 7 hours in the middle of night all the way to Fort Campbell Army Base where he was stationed, and we had a magical weekend, which would then become our official “started dating” anniversary. Well that was 10 years ago, and we’ve been married for 9, and have an 8 year old. Wow, what a whirlwind of a startup that was! After you get married, you tend to stop celebrating the little anniversaries. And its a crime. Tomorrow is never promised, and I love to think back to the days when I was 19 and he was 21 and we were madly in love, so much that I quit my crummy job, left my entire life and hometown behind, just to be with him. And as I was reflecting on all the small miracles that had led us to the life we now have together, it occurred to me that the least I could do was cook a spectacular dinner for us. And when I think of decadence beyond measure.. I think of PORK. Not steak, not shrimp, a good tender piece of pork can out do the fanciest of meals. And the best way I know how to fix it, is like this. I started with a cheap pork roast. Thats right. The bottom shelf, in the nylon net mystery pile of pork roast. This cut of meat isn’t pretty, but its tender, and a good fat ratio to ensure the tastiest of dishes. I choose to cover its uglyness and contain is irregular shape by wrapping it in more pork. But pork that is salty, seasoned, and adds texture: BACON. 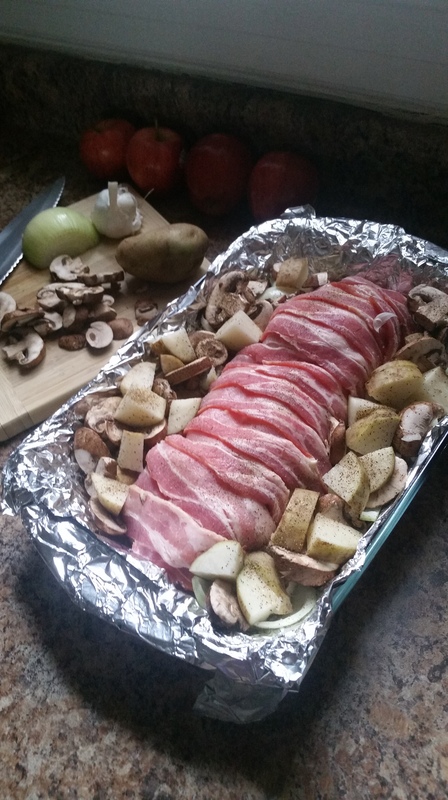 After wrapping the pork into a bacon log, I then chop the potatoes, onions and mushrooms and line them down the sides of my roast. I also take WHOLE CLOVES of peeled garlic and tuck them in under the bacon. No seasoning required to this pork. I let the bacon and garlic just surround it with love and let its own flavor really shine. I only lightly salt the vegetables, and also don’t add any oil to them!! The grease from the meat will cook the bottom of them until they are tender and savory and the tops will have the perfect bite texture. I cook this low and slow. I put it in at 350ºF for around 4 hours. I also make an aluminum foil little tent for my roast. NOT tight around the sides, just a barely over the top in a triangle up, so that way the bacon doesn’t burn on top, but its gets plenty of air. 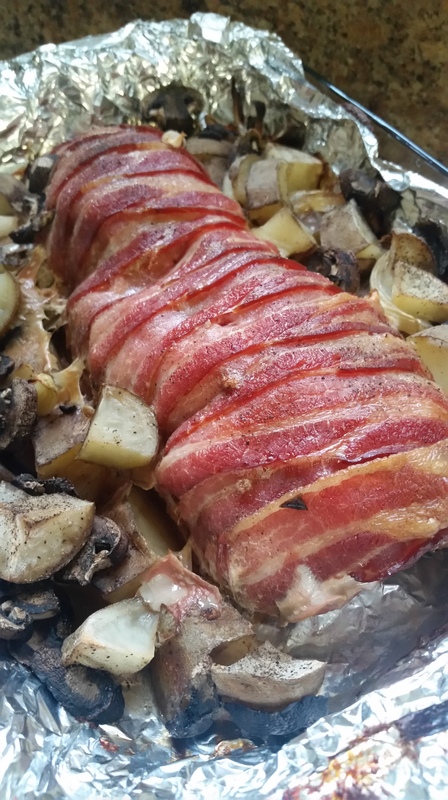 Nobody likes soggy bacon, and tightening down the aluminum foil around the sides will give you just that. I measured the temperature of the very center of the roast to be sure it was up to temp, and it quickly jumped to 180ºF on my meat thermometer, telling me that my roast was beyond a shadow of a doubt, cooked all the way through. I then let it rest for about 10 minutes before slicing. This gives the meat time to shrink after being exposed to room temperature, and taking all its delicious juices with it. Cutting it without letting it rest results in a lot of wasted juice running through the bottom of your pan, and that stuff is liquid gold! 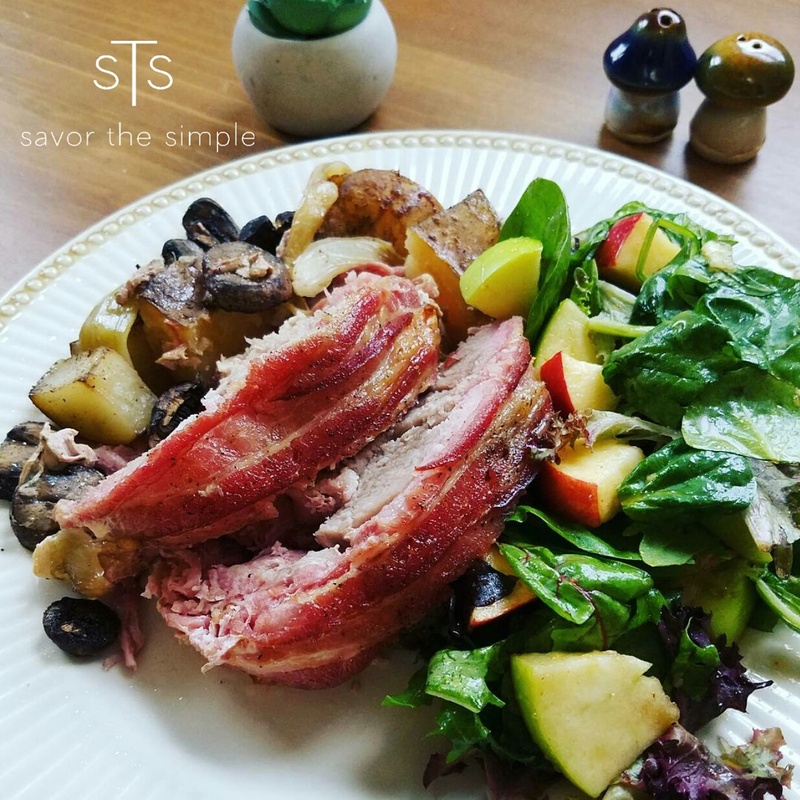 Apples are a natural compliment to pork, and this dish was so rich already, I wanted something clean and bright to go on the side. I decided on a tangy apple salad. Basically greens salad mix, apples and a quick and EASY homemade vinaigrette dressing. I just put all the ingredients into a jar shook it well for a few minutes and BAM. Instant amazing tangy dressing. I lightly tossed the diced apples, granny smith preferred, but any apples will work and salad greens, and it complimented this dish perfectly. Ingredients for Tangy Apple Salad Dressing: Add to a jar and shake! So Irma is making it rain here non-stop. My husband is sick, and overall everyone in this house could use some healing magic, AKA Mom’s Chicken Noodle Soup. This is one of my familys favorites, and an instant request anytime that anyone in our family is feeling crummy. I don’t mind at all its stupid easy, healthy and hearty. I start with my large soup pot. I can cook this quickly or slowly or even in the crock pot. But my favorite is in the big soup pot, on a low simmer all day, so its heavenly smell can fill the house. In the big pot on a med-low I put olive oil and butter and garlic, and a heaping pile or garlic. You can use fresh or I like the jarred minced kind for convenience. I then place 4 frozen chicken breasts and cover them with the chopped vegetables and herbs and when the oil starts to sound poppy, I add the chicken broth until its all covered. I cook the noodles separately and add them together at the last minute. This keeps them from completely disintegrating while the vegetables and chicken reach their tender delicious destination. The vegetables I choose are the classics: onion, potato, celery, and carrots. The herbs I choose are finely chopped, and come in a convenient poultry herb pack : sage, thyme and rosemary. What did I tell you? EASY. The noodles I choose are extra wide egg noodles. 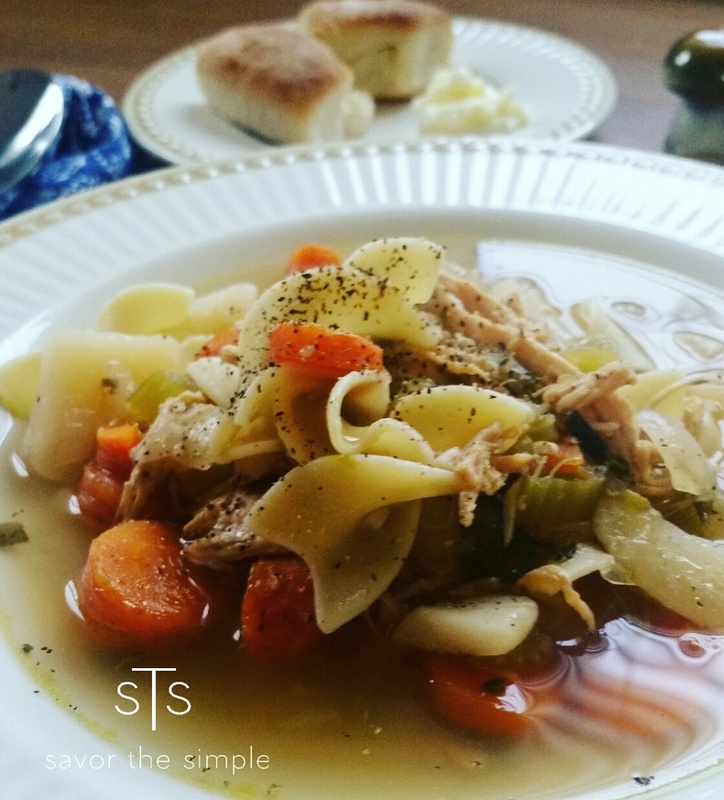 They cook quickly, are packed with protein and I love the flavor of these noodles in chicken soup. I cook and add them to the soup just before serving, storing, or freezing. Add salt and pepper to taste and this soup will cure anything that ails you! Especially hunger for something that tastes like home. 2-3 quarts chicken broth (if you leave it slow all day you should only need 2. But sometimes if you boil the soup on too high of heat, the liquid will disappear, and you may need more broth. If your out of broth:: add water and chicken bullion cubes. Great broth solution in a pinch! 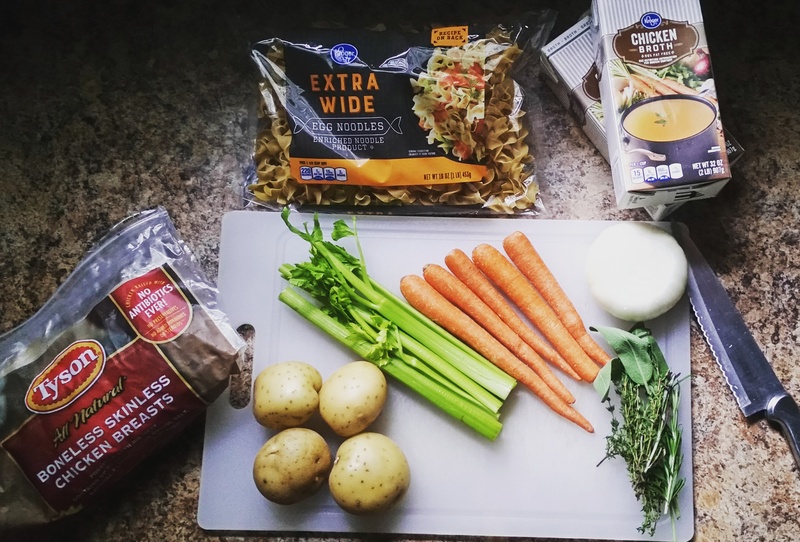 What are your favorite simmer all day soups?? I would love to try them! !